A medium to full body cigar with a full flavor profile accented with spicy notes. 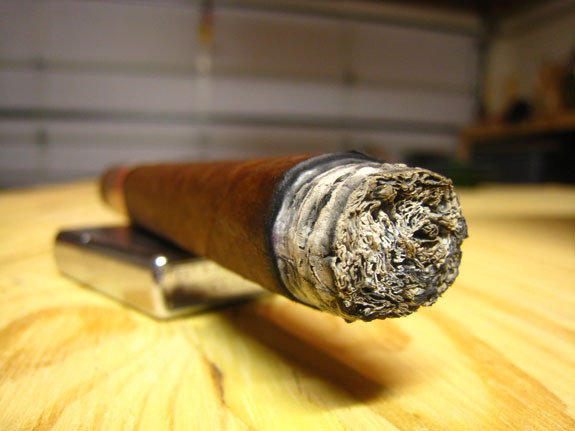 Uniquely blended by Miguel Cuenca, with a taste group of five seasoned smokers at Cuenca, Cigars of Hollywood, Florida, and later on with the final approval by Ana Cuenca. “This is how we do things at Cuenca Cigars…The blending process is multi layered to insure the best quality,” said Ana Cuenca. The Cuenca 5 reinforces the model behind Cuenca cigars of cultivating consumer palates by allowing the smoker to freely experience the many flavors of the Cuenca Humidor and developing a sophisticated palate. 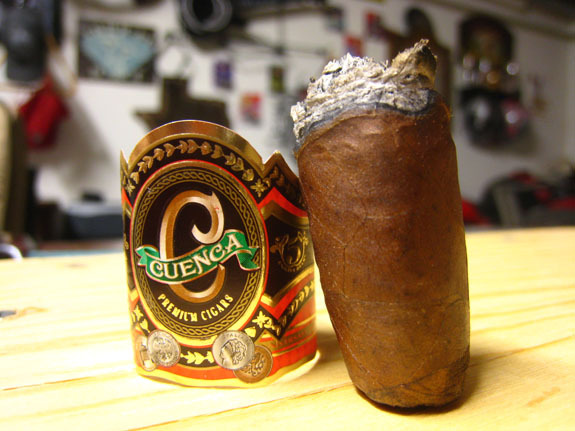 The complexity of the cigar is owed to the testing process of the Cuenca Customers, and we would appreciate a fully engaged feedback process by you in our reviews of the cigar. After all the Cuenca 5 celebrates our appreciation to you as our Customer for the past 5 years. Our goal was to blend a cigar with complexity and a lot of flavor. 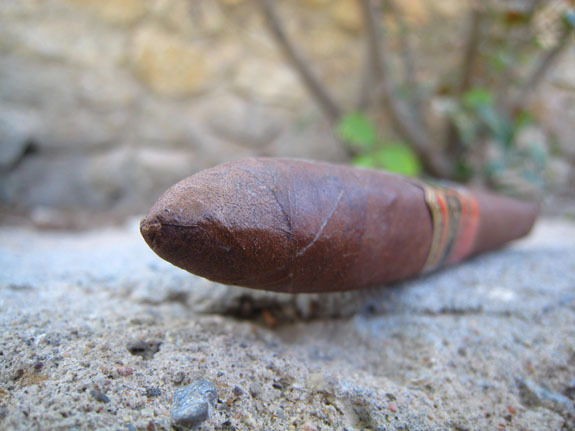 We did not want to come out with a mild blend; we love spicy and full bodied cigars. We want to be known and defined for offering a spicy and strong product. We also love to be “different”, in every possible way. Did you notice the absence of the “th” in 5? We like it like that way, and 5 is a great number for us. “Cuenca 5 Anniversary” will have an initial batch of 500 boxes. Full production will be up to 100,000 Cigars. All boxes will be signed by Miguel Cuenca. The cigar is a 7 x 54, Torpedo Box pressed, with carefully selected dark Habano wrapper from Nicaragua. It is aged and cured by AJ Fernandez the creator of San Lotano Cigars, a good friend of the Cuenca Family. They come in an elegant cedar box which contains 10 cigars. First off, this is a great looking stick. The milk chocolate wrapper is consistent in color from head to foot and is smooth to the touch with the smallest of veins. The festive band is quite large but fits this 7 by 54 behemoth of a cigar. The Habano Oscuro wrapper gives off chocolate, manure, and mild pepper, with the foot showcasing sweet tobacco, chocolate, and pepper. The pepper off the foot is already stinging my sinus passage. This stick may be a spice bomb! The box pressed format makes the Cuenca 5 Anniversary very manageable. This is one of my favorite formats for a large cigar. 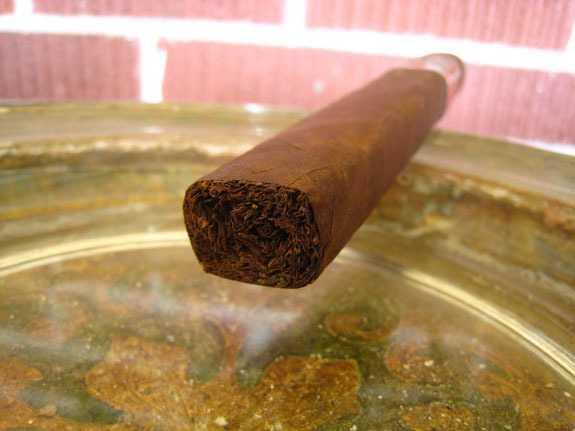 The cigar has no soft spots and gives slightly when squeezed. The wrapper transitions to the cap neatly making it barely noticeable. The cap clips clean exposing a draw with a nice amount of resistance. The cold draw leaves a spice tingle on my tongue but not much in the flavor department. Upon toasting the foot, I’m instantly greeted with a good amount of spice which quickly fades and mixes in with flavors of caramel, cedar, and pepper. The pepper is heavy on the retrohale, tickling the back of throat. The dusty chocolate finish is long with a lingering spice. While puffing away in the first third, I already begin to notice a transition to much darker flavors of coffee and roasted notes. Just like determining the age of tree by the number of rings, you could count the number of puffs I have taken on the stick from the black and white layered ash it is leaving. The burn line is razor-sharp and the ash held on over inch. The draw is a little snug but producing a decent amount of smoke that is medium/full in flavor and strength. The caramel has moved on as I make my way into the second third and citrus notes enter the profile. I continue to pick up a lot of woodsy notes of cedar with an added layer of oak. I am wrong about the caramel, it is once again in the flavor make-up. The Cuenca has found a great rhythm. The profile bounces back and forth from caramel and wood notes to pepper, coffee, and toasted flavors. While the retrohale is on the spicy side, I am really enjoying it. I have been retrohaling the heck out of this 5 Anniversary, which may be contributing to the nicotine I am now feeling. The smoke has become chewy in the mouth coating my palate with each draw that is now delivering a copious amount of smoke. A slight wave develops in the burn line but quickly corrects itself. The flavors are full and the strength is creeping up on me putting it into the high-end but not unbearable. The flavors settle into a combination of vanilla bean, caramel, and oak much like spiced rum. There is also a meaty flavor entering the profile. It reminds me of the smell from a wood smoker. I have been so focused on the flavors that I almost burned right into the band. As I nub the cigar, the black coffee and citrus begin to dominate the profile but I have not encountered any harshness. The smoke is no longer chewy but a bit dry. However, my palate is still able to recover by itself (good thing because I’m out of water and too lazy to walk inside). The burn line is rock solid. The strength has steadily picked up throughout the stick and I’m wishing I had a soft drink or something with some sugar to counteract the nicotine. I may be putting a sugar cube under my tongue after I finish this stick. The Cuenca 5 Anniversary is a solid smoke. It is rare to come across a cigar that A.J. Fernandez has his hand in and not enjoy it. This cigar is no exception. The jumping back and forth of flavors kept me engaged the entire 2 hours and 10 minutes. It is difficult for me to find time to enjoy such a larger stick but this would be a wonderful cigar to have on hand when time permits. 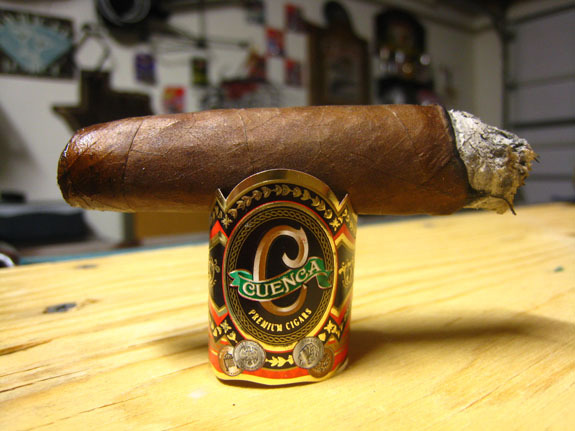 The format and packaging of this stick screams “celebratory cigar”, but, with a price of $8.50, the Cuenca 5 Anniversary could be enjoyed anytime. Jeremy~ Mr Casas? You might swell Tony’s ego if he gets too much formal talk.. I cannot agree with you more when it comes to Cigars that have the hand of AJ Fernandez in it, Around my area (Philly) a cigar that is widely available is Emilio’s~ an amazing cigar made by AJ, yet blended by a guy named Gary Griffith. Gary is amazing and his cigars pack my humidor.. Thanks for your comment about the possible paring change as well~I’ll get my french press out if I get some of these..
Sir Casas sounds better. Master Casas? Lord Casas. Sir Tony of New Belgium – Lord of the Ring Gauges. You are right, it is already going to Tony’s head. I am huge fan of Emilio cigars, especially the AF2. I can’t find them locally, but whenever I travel over to the Phoenix area I always grab a handful of them. 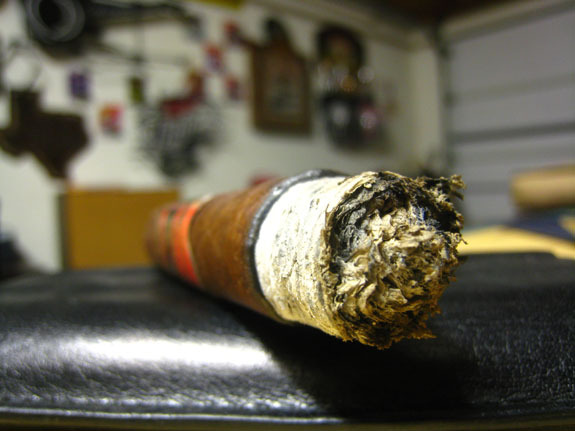 A Driag K is waiting in my humidor….may have to light it up this week. Great review, Draig K’s are awesome, smoked one? bought a box the next day, Dry Box it for at least one day or you will have construction issues. Thanks for the advice! You may have saved my sanity. I get a little obsessive over construction issues. Thanks Jeremy for taking the time and smoke Cuenca 5 Anniversary. It will be a pleasure to meet you soon. Not too mention how welcome you will be to our store! 🙂 Will be sending the new sizes as soon as they become available. Thanks for checking out the review. You guys have created a great stick. I look forward to trying the new sizes! Hi Jeremy, just got the good news (Top 10 # 6 Cuenca 5 Anniversary Cigar on Casas Fumando) just a couple of hours ago. Busy here, we are having a New Year Party tomorrow with Lechon and Congris! Will love you guys were close by. Anyway, I am very happy for been on the Top 10 List, that’s an honor my friend! We have already expanded the line to Toro and Robusto (so, 3 sizes in 10 Counts Boxes). I sent you the Robusto a couple of weeks ago and the Toro should be on your hands beginning of January. Hope you also like them. I am in love but that’s doesn’t count… lol! You guys and the customers are the best reference ever. Thanks again! Wishing you and the folks at Casas Fumando a Happy New Year and a prosperous 2014. Hope you guys visit Florida and us, on 2014!